In an article I wrote a little over a month ago I compared two different semi-auto handgun cartridges using the same .355-inch diameter bullets: The 9x19mm Parabellum and the .357 SIG. Today I’m doing another comparison, this time pitting two of the biggest, fattest and heaviest semi-auto handgun cartridges on the market against each other: the venerable .45 ACP, a military sidearm caliber which has continually withstood the test of time; and the relatively newer but nonetheless respectable 10mm, the parent cartridge of the .357 SIG and the .40 S&W. Before I do the comparison, let’s look at how each of these fine cartridges came into existence. The .45 ACP was developed in the late 1800s by the legendary John Moses Browning to answer the US military’s demand for a more powerful cartridge to supersede the then-standard-issue Colt Model 1892 New Army. The Model 1892 is a double-action revolver chambered for the .38 Long Colt which is the weaker parent cartridge of the .38 Special that’s still in use today and is regarded as the lowest power revolver cartridge acceptable for self defense. Before it was adopted for military use, the .45 ACP was chambered for the Colt Model 1905, a revision of the Model 1900 which was a semi-automatic handgun also designed by John Moses Browning but chambered in .38 ACP, itself an obscure and weaker version of the now relatively common .38 Super. The original cartridge specification for the .45 ACP called for a .451-inch diameter projectile weighing 200 grains that could be shot from the Model 1905 at a velocity of 900 feet per second. The Model 1905 proved to have too many reliability issues, all of which were addressed in what is now commonly known as the Model 1911, the quintessential all-steel semi-auto handgun that represents America. Because the new handgun was designed to be stronger than its predecessor the Model 1905, the new .45 ACP cartridge specification was changed for better ballistic performance. The new load uses the same .451-inch bullet but weighs 30 grains more while moving at a marginally slower velocity of 850 feet per second. This was the .45 ACP load adopted by the military. 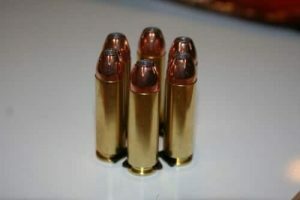 And up to the present, it is not uncommon to see these loads on the shelves of ammo dealers everywhere in the country. The Model 1911 loaded with seven rounds of 230-grain .45 ACP rounds continued to be the standard issue sidearm of the US military up to 1985. 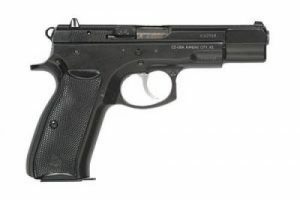 It was at that point that the higher-capacity Beretta M9 with 15 rounds of standard 9x19mm NATO in its staggered-column magazine superseded it. A Belgian firearms manufacturing company called Fabrique nationale d’Hersta, or FN Herstal for short, commissioned John Moses Browning to design a new sidearm for the French military. 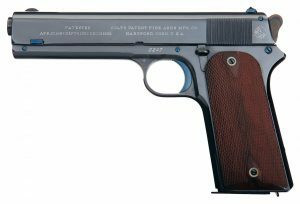 Colt had bought the rights to his Model 1911 design and had it patented so he had to come up with a new design, which he was unable to finish because he died in 1926. Dieudonné Joseph Saive, a firearm designer working for FN Herstal, finished the design. After a few years of revisions, the new design — a semi-auto handgun with 13 rounds of 9mm in the mag, was ready for mass production. 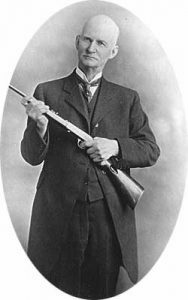 Nine years after John Moses Browning’s death, a new handgun was born. Named after its designer, the Browning Hi-Power became the standard issue sidearm of the Belgian army that year and would later become the inspiration for many handgun designers building double-stack handguns chambered for the 9mm. 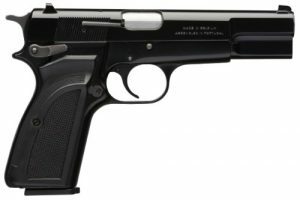 Over a decade after World War II, a few double stack 9mm handgun models similar in working concept to the Browning Hi-Power started creeping their way into the Police and civilian markets which were largely dominated by the 1911 chambered in .45 ACP and six-shot revolvers chambered in .357 Magnum. But the 9mm cartridge, having a weaker ballistic performance compared to the 45 ACP and the .357 Magnum, continued to be met with skepticism. For its critics, the only good thing about the 9mm was the fact that semi-auto handguns chambered for it use high round count magazines. So there was quite a dilemma. Should the police and civilians settle for the high capacity but weak and unpopular 9mm semi-autos vs. the highly respected and prevalent but ageing .45 ACP 1911s vs. the powerful and street-proven but cumbersome .357 Magnum revolvers? Two businessmen by the name of Thomas Dornaus and Michael Dixon set out to find an answer to that dilemma. They designed and built a new handgun based on the CZ-75 which is a double stack 9mm handgun mechanically based on the Browning Hi-power. But the new handgun was only chambered for the .45 ACP. The 10mm cartridge was initially conceived and developed by Jeff Cooper, himself a .45 ACP purist, in 1983. He wanted a cartridge that would perform better than the .45 ACP by using a 200-grain, .40-inch bullet that could be shot out of a 5-inch barrel at velocities of around 1,200 feet per second. But he needed a new handgun for his cartridge, so he went to Dornaus & Dixon Enterprises and met with the two businessmen. The three gentlemen formed a trio and built a new handgun some time later that year. It would be called the “Bren Ten”. They then went to bullet manufacturer Sierra to get .40-inch diameter 200-grain bullets and contacted one of Jeff Cooper’s friends, John Donnelly, to handload the first 100 cartridges it would chamber. 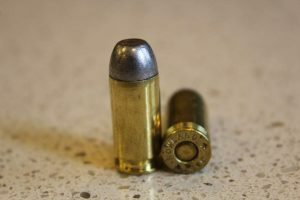 He put a 45-degree extractor groove under the case head of a .30 Remington brass, then he cut the case to 0.99 inch length, put powder and seated the bullet in so that the overall length of the cartridge was 1.26 inches from the base to the bullet’s nose. 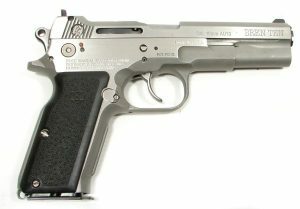 The resulting handloaded cartridge was initially called the “10mm Bren”. The trio approached ammunition manufacturing companies like Super Vel and Hornady to mass-produce the new cartridge but they were turned down. It was a Swedish ammunition manufacturer, FFV Norma AB (now Norma Precision AB), who committed to manufacturing the brass and powder and put together the entire cartridge later that same year. 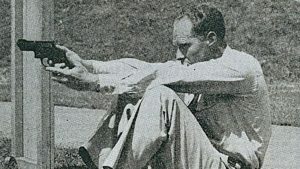 The powerful new cartridge produced by Norma was loaded hotter than Jeff Cooper’s concept cartridge and used a .40-inch diameter 200-grain bullet with a velocity of 1,260 out of a 5-inch barrel. Michael Dixon christened it the 10mm Auto. 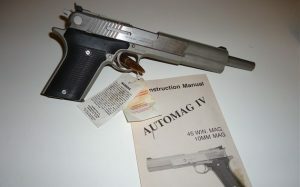 In 1986, the FBI considered adopting the 10mm cartridge as a replacement for their then standard issue 9mm after most of their agents were killed during the FBI Miami Shootout. But they deemed the 10mm too powerful for everyday law enforcement use. Some FBI agents with smaller stature had difficulty controlling its recoil, so they started down-loading the cartridge. This ultimately resulted in Smith and Wesson developing the .40 S&W, a cartridge using the same bullet and case as the 10mm’s, but because of the reduced powder load there was a good portion of the case that wasn’t utilized so it had to be shortened. This new 40-caliber round would overshadow its parent cartridge for a while. The 10mm had fallen to obscurity for decades. But two well-known firearms companies continue to manufacture handguns chambered for it: Colt and Glock. And in the past several years it has had a resurgence. As far as popularity, the 10mm still isn’t as popular as the .45 ACP, or the 9mm, or the cartridge that attempted to replace it, the .40 S&W. But it isn’t considered a wildcat round either, as there are a good number of handguns being produced to chamber it and there’s 10mm ammo just about everywhere in the country. If you have to compare two of the more powerful semi-auto handgun cartridges in the world, how do you do it? 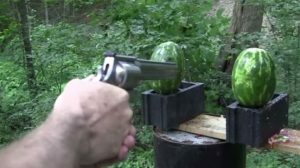 I’ve seen a lot of people shooting watermelons, pork, ham, chicken and ballistics gelatin everywhere on the interwebz. While those activities sound fun (and they are), given the nature of the two cartridges in question and being a numbers kind of guy, I would prefer to do a comparison through quantitative analysis. By no means am I trying to discredit all those people. I think they provide an alternative perspective that helps flesh out all but the tiniest intrinsic details when comparing these two rounds. And having shot a lot of inanimate objects myself (steel plates and silhouette targets mostly), I know how fun it is. But this comparison wouldn’t be any different than others if I just shoot stuff and give my opinion on which is better. A quick disclaimer: As most enthusiasts would know, some .45 ACP loads have a +P designation while the 10mm doesn’t. I had to plug +P numbers for two .45 ACP loads because I couldn’t find a standard pressure load for the bullet weights that I think the comparison requires. If you feel like doing it this way would skew the results somewhat, do note that just about all modern handguns chambered in .45 ACP are rated for +P loads. What that means is, these days it doesn’t matter if you’re shooting +P loads as long as you can afford the ammo and your handgun can handle the slightly higher pressures. 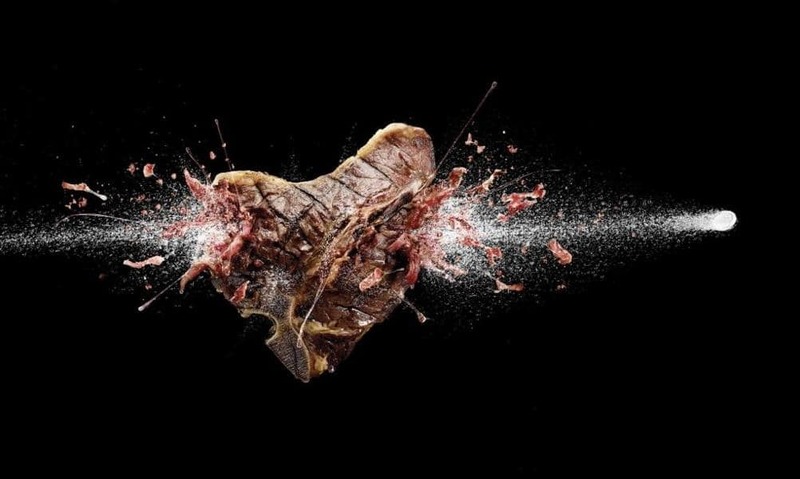 Recoil velocity (muzzle flip) and recoil energy (felt recoil) are easy to calculate, as the equation only requires four things: a bullet’s weight, its velocity, the powder charge weight and the firearm’s weight. That, and there’s this online recoil velocity and recoil energy calculator. To make recoil comparisons as objective as possible, I plugged verified powder load data values (weight in gr.) for each cartridge and the weight (in lbs.) of the handguns chambered for either cartridge. To compare recoil in all-steel handguns, I picked the Colt 1911 chambered in .45 ACP and the Colt Delta Elite chambered in 10mm. The former weighs 2.4 lbs. while the latter weighs around 2.43 lbs. Both are full-size pistols manufactured by the same company. Both also have a 5-inch barrel. To compare recoil in lighter polymer handguns, I picked the Glock 21 chambered in .45 ACP and the Glock 20 chambered in 10mm. The former weighs 1.83 lbs. while the latter weighs 1.93 lbs. Both are medium-size pistols manufactured by the same company. Both also have a 4.6-inch barrel. Availability and pricing are two things inextricably linked to each other. A product with a high price is often a rarity and typically difficult to acquire. On the other hand, a product that is prevalent can often be bought rather cheap. It’s just how the law of supply and demand has always worked. In addition to how much each of the six different ammo loads costs per round, I’ll also include pricing info on the four aforementioned handguns for the benefit of our readers who may be in the process of making a decision as to which platform to choose. The lightest bullet I could find for the .45 ACP is from SinterFire which weighs 155 grains, while the lightest for the 10mm is from Underwood and weighs 135 grains. The lightest 10mm bullet has a velocity of 1,600 feet per second, 39% faster than the lightest .45 ACP bullet, resulting in the 10mm generating 767 foot-pounds of force, a 69% higher kinetic energy at the muzzle compared to that of the .45 ACP’s. When shot from an all-steel 1911, the 155-grain .45 ACP bullet will have a recoil velocity of 12.69 feet per second and a recoil energy of 6.01 foot-pounds of force. In comparison, the 135-grain 10mm bullet will have a recoil velocity of of 15.81 feet per second and a recoil energy of 9.44 foot-pounds of force when shot from a similar-weight, all-steel Colt Delta Elite. This translates to the Colt Delta Elite having 25% more muzzle flip and a 57% more painful felt recoil than a Colt 1911 when the lightest 10mm load is used. When shot from the lighter Glock 21, the 155-grain .45 ACP bullet will have a recoil velocity of 16.65 feet per second and a recoil energy of 7.88 foot-pounds of force. The 135-grain 10mm bullet, when shot from a similar-size, similar-weight Glock 20 will have a recoil velocity of 19.91 feet per second and a recoil energy of 11.89 foot-pounds of force. This means the Glock 20 will have 20% more muzzle flip and still more painful felt recoil, 51% more than a Glock 21 when the lightest 10mm load is used. For the same-weight-bullets comparison, we’re comparing bullets from the same ammo manufacturer, Buffalo Bore. They offer a 200-grain .45 ACP +P with an advertised velocity of 1,050 feet per second generating a muzzle energy of 490 foot-pounds of force; and a 200-grain 10mm with an advertised velocity of 1,200 feet per second, generating a muzzle velocity of 639 foot pounds of force. The 10mm in this comparison is only 14% faster but has 30% more kinetic energy at the muzzle. Side by side with the % differences in velocity and muzzle energy between the lighter 10mm and .45 ACP bullets compared previously, we can see that the .45 ACP when loaded to +P levels can close the ballistics gap somewhat, but the 10mm having 30% more muzzle energy will still be significantly more powerful. Shot from a Colt Delta Elite, the 200-grain 10mm will have a recoil velocity of 17.52 feet per second, which translates to a marginal 16% more muzzle flip compared to shooting the 200-grain .45 ACP +P load from a Colt 1911. Comparing felt recoil, the 200-grain 10mm shot from a Colt Delta Elite will have significantly more felt recoil at 37% compared to the 200-grain .45 ACP +p from a Colt 1911. When shot from the Glock 20, the 10mm 200-grain load will have a recoil velocity of 22.06 feet per second, resulting to only 11% difference in muzzle flip compared to a 200-grain .45 ACP +P shot from a Glock 21. The difference in recoil energy is only 31% between the two cartridges when both are shot from their respective polymer handguns. The .45 ACP+P will still have a significantly softer felt recoil, which is to be expected because the typical bullet weight for the .45 ACP is 30 grains heavier than the bullet from this Buffalo Bore +P load. For our last round of ballistics performance comparisons, we picked the heaviest bullet we could find for either cartridge. Buffalo Bore offers a 255-grain .45 ACP +P load and a 220-grain 10mm load. It’s interesting to note that Buffalo Bore is still able to push a heavier 220-grain 10mm bullet at the same velocities as their 200-grain 10mm load (both have a velocity of 1,200 feet per second when shot from a 5-inch barrel). The difference in velocity between the two hot loads is significant with the 220-grain 10mm bullet being 30% faster than the .45 ACP +P. Looking at muzzle energy, the 220-grain 10mm generating 703 foot-pounds of force at the muzzle is 45% more powerful than the stoutest Buffalo Bore load in .45 ACP +P. And for our last round of recoil comparisons, we can see that differences in recoil between the two cartridges’ heaviest bullets have become relatively marginal. From a Delta Elite, the 220-grain 10mm will have a recoil velocity of 18.46 feet per second, which translates to 7% more muzzle flip compared to shooting the hottest 255-grain .45 ACP +P from a Colt 1911. The 10mm shot from a Delta Elite will also have a relatively higher recoil energy of 12.87 foot-pounds of force, which means it’ll have 17% more felt recoil compared to shooting a 255-grain .45 ACP +P bullet from a 1911. When shot from a Glock 21, the .45 ACP +P will have only 3% less recoil velocity compared to shooting a 220-grain 10mm from a Glock 20, which means difference in muzzle flip between the two platforms is minimal. Felt recoil is also marginally lighter when shooting the .45 ACP +P in a Glock 21, only 14.46 foot-pounds of force and 12% less compared to shooting a Glock 20 loaded with a 220-grain 10mm. This means as far as felt recoil, when shooting the hottest available loads for either cartridge, there won’t be too much difference. From the table above, it can be surmised that there really isn’t a big difference between .45 ACP and 10mm per-round price. 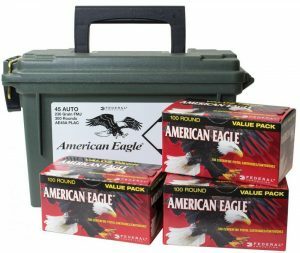 So contrary to popular opinion, these days ammo availability for the 10mm won’t be an issue. The same can be said about each of these cartridges’ shooting platforms. 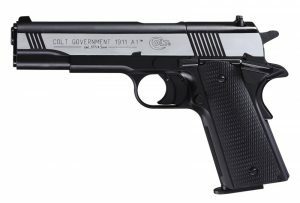 The Colt Delta elite is only $76 more expensive than the more common Colt 1911. If that difference matters too much, I’d recommend looking into the two Glock pistols above, which I also compared to each other in this article. As a side note, there are tons of 1911 in .45 ACP out there that costs only around ~$300. And there are handguns like Hi-Points as well. As far as ballistics, the 10mm in any of the three loads analyzed will outperform any .45 ACP standard or +P pressure loads. This shouldn’t come as a surprise because Jeff Cooper designed this cartridge with that particular objective in mind. The lightest 135-grain 10mm will be 39% faster and 69% more powerful than the lightest .45 ACP load while costing $0.88 per round, only $0.03 more expensive. The heavier 200-grain 10mm will be only 14% faster and 30% more powerful than the relatively light 200-grain bullet in a .45 ACP +P load, and yet it’ll be $0.05 cheaper. The hottest 10mm load that uses a 220-grain bullet will still be 30% faster and 45% more powerful than the hottest .45 ACP +P load, but it’ll only cost $0.08 more. If recoil is put into consideration, the .45 ACP will always have a softer recoil, and depending on the operator’s shooting skill, will be easier to handle and faster to shoot. Shot from a Colt 1911, the lightest .45 ACP load with a 155-grain bullet will be 25% easier to control and 57% easier on the hands. From a Glock 21, the same bullet will be 20% easier to control and 51% easier on the hands. Shot from a Colt 1911, the relatively lighter 200-grain bullet for a .45 ACP +P load will be 16% easier to control and 31% easier on the hands. From a Glock 21, the same 200-grain bullet will be 11% easier to control and 31% easier on the hands. Shot from a Colt 1911, the hottest .45 ACP +P load using a 255-grain bullet will only be 7% easier to control and 17% easier on the hands. From a Glock 21, the same 255-grain bullet will only be 3% easier to control and 12% easier on the hands. Ballistics wise, the 10mm wins over the .45 ACP. As far as felt recoil and controllability, the .45 ACP wins over the 10mm when using lighter loads, but for the heaviest loads the difference is marginal at best. Since it hasn’t been mentioned yet, the 10mm is also better than the .45 ACP when talking about ammo capacity in handguns. The Colt Delta Elite comes with 8-round mags while typical 1911s only come with 7-round mags. The Glock 20 also comes with 15-round mags while the Glock 21 only comes with 13-round mags. That’s ~15% more ammo in the mag in favor of the 10m by virtue of its case dimensions. But we can’t declare the 10mm the winner just yet. Some people would recommend sticking to common self-defense handgun calibers (e.g. .380 ACP, 9mm, .40 S&W and .45 ACP) when carrying a CCW as opposed to carrying a handgun chambered for more powerful cartridges like the 10mm because of legal concerns. It is sad, but the truth of the matter is there are just too many people ignorant about firearms, some of them lawyers and prosecutors who would do anything to further their career. From my perspective, shooting a bad guy’s center of mass with a handgun shouldn’t be a big deal regardless of handgun caliber as long as you can prove that you did it to defend yourself or a loved one. For anyone who hasn’t heard of Harold Fish, I would highly recommend to do some research on his case before carrying any 10mm handgun concealed for self defense. Long story short, he was going to be attacked by a guy so he shot him and he ended up serving three years in jail because the handgun he shot the guy with is chambered in 10mm. The 10mm doesn’t have any known conversions. I’ve heard of the 10mm Magnum, a rimmed cartridge that uses a 1.255-inch-long case, which is 26.77% longer than the 10mm’s 0.99-inch-long case. But there has only ever been one semi-auto handgun model chambered for this round, the AMT Automag IV. No handgun chambered for the 10mm can be converted to accept the 10mm Magnum simply because the long case won’t fit in standard size 10mm magazines. I’ve heard of people reaming the chambers of their S&W 610 to accept the longer cartridges, but if we’re talking revolvers I’d much prefer a S&W 460 XVR for anything larger than a human. This is where the .45 ACP gets a huge point for me. I think one of the best reasons why anyone should consider getting an all-steel 1911 in .45 ACP or a Glock 21 is because of a conversion kit that allows for these handguns to shoot the powerful .460 Rowland, a proprietary cartridge which measures 0.960 inches long, only 6.9% longer than a standard .45 ACP case which measures 0.898 inches in length. This cartridge mimics light .44 Magnum ballistics in a semi-auto. 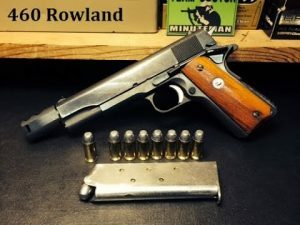 The hottest load available on Johnny Rowland’s website uses a 250-grain .451-inch diameter bullet that can fly out of a 5-inch barrel at blistering speeds of up to 1,300 feet per second, generating a muzzle energy of 957 ft.lbf. It’s significantly more powerful, rivaling even the hottest .357 Magnum loads and approaching lighter .41 Magnum levels. It has greater velocity, which means it’ll be more accurate over longer distances. The bullet’s width, being a little slimmer than a .45 ACP, gives it a better ballistic coefficient, making it retain more of its kinetic energy over longer distances. Because of its higher muzzle energy, higher velocity and better ballistic coefficient, to me it would be great for hunting deer-size game at up to 100 yards. Handguns chambered for 10mm will fit more rounds in the mag compared to .45 ACP handguns. Having a lighter recoil, it is relatively easier to control than the 10mm, which makes it a great round for a CCW. Having less felt recoil, I can shoot it all day at the range without my hands feeling sore. In case I’d have to really shoot someone to defend myself, I’d have an easier time in court. There are way more handguns on the market chambered for this round than the 10mm, which makes the platform cheaper. If I would want more power, I could convert almost any .45 ACP handgun to shoot the .460 Rowland (assuming the handgun is compatible with the conversion kit). The .460 Rowland’s impressive ballistics makes it pointless to get a 10mm. But I’ll have to save up because the conversion kit isn’t cheap. All things considered, the .45 ACP has the slight upper hand in terms of practicality. We can say the .45 ACP wins, albeit only very marginally. But really, why settle for either one when you can have both? Handguns and ammo are fairly cheap for these two cartridges anyway. I’d really recommend going for both. It is for this reason that I would have to declare this round… a draw. I live in west Texas, not far from the border, and take the wife shopping, or go scuba diving down in the Yucatan. Mexico has its’ own set of peculiar gun laws, the main one being you cannot bring a firearm (of any kind) into Mexico that is chambered in a military caliber. No 45 ACP, 9 mm Parabellum, 308 Winchester, 30-06, or 5.56 mm. So much for my grandfather’s Model 70 Winchester 30-06 deer rifle. I have a 1911 in 38 Super, a Glock in 40 S&W, and a Sig-Sauer in 357 Sig. None of these weapons have the man stopping power of the 45 Auto. 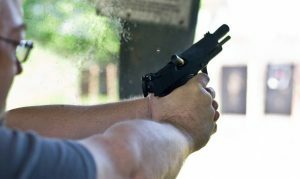 This article has helped me understand the differences between the 45 ACP and the 10 mm. I am in the market for a new pistol, in 10 mm. Now I have to decide if I need something concealable, or get a full size auto. Of course, I have to negotiate the cost of a shopping trip to Mexico against a new pistol. Rock, I’ve heard of Mexican gun laws in forums and find them absurd. I didn’t know 10mm is allowed though (I’ve always thought anything bigger than .35 caliber in handguns isn’t allowed). If you’re in the market for a 10mm CCW piece I’d recommend a compact (~4-inch barrel) pistol so you get the best of both worlds — the EAA Witness in 10mm compact should fit the bill. It shouldn’t be too hard to conceal but still provides more room for bullet acceleration and better recoil control. But you can go full-size if you won’t have problems with concealment. I wouldn’t recommend a subcompact (e.g. a Glock 29) but if you’re okay with its recoil and slightly worse ballistics (shorter barrel = lower velocity), then you can go for it. I’ve shot both but prefer my .40 S&W MP Shield. You potentially missed a step when talking about the recoil impulse transferred to the shooter. 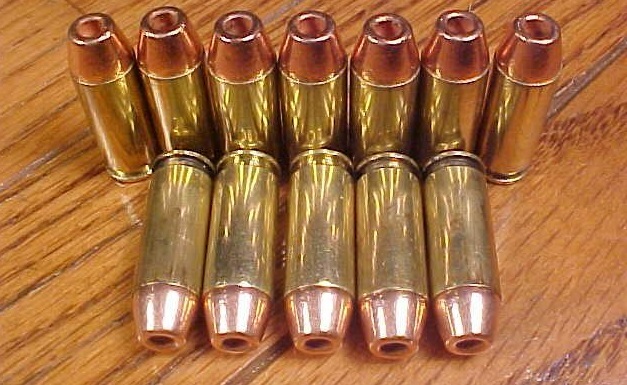 In common loadings, 10mm tends to use faster burning powder than .45 ACP, due to both the smaller case volume and typically higher velocities of the 10mm auto. So the energy transferred to the shooter with a 10mm cartridge can feel like it is delivered over a shorter period of time and a larger amplitude of felt recoil impulse. Smaller-statured shooters may be more likely to express the felt recoil of the 10mm as jerking upward and twisting along the barrel axis, while those same shooters may feel like the .45 ACP has a tendency to shove more linearly to the rear with less felt muzzle climb.